Virus Bulletin, a leading independent testing authority, has completed its VBSpam Comparative Review for June. The review reconfirmed that ESET Mail Security for Microsoft Exchange Server remains a market leading choice for spam filtering, receiving its fourth VBSpam+ award in a row. In the 44th VBSpam Comparative, ESET Mail Security for Microsoft Exchange Server achieved a final score of 99,999 with no false positives. "Lately, ESET has been one of the best performing products in our VBSpam Comparatives with very strong results. Taken together, a long history of excellent performance and no false positives, is a clear indicator of a reliable spam filtering product for business,“ said Martijn Grooten, Editor of Virus Bulletin. “ESET continues to prioritize spam protection and its place in our multilayered approach to next generation security. Keeping our spam catch rate at the highest possible level and false positives to zero means that we are blazing the right trail to safer technology,“ comments Palo Luka, Chief Technology Officer at ESET. 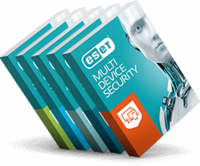 Visit www.eset.com to learn more about ESET cybersecurity portfolio. Award-winning ESET detection technology gives you fast, powerful anti-malware protection for your PC or Mac, whether you’re surfing, working or gaming online.